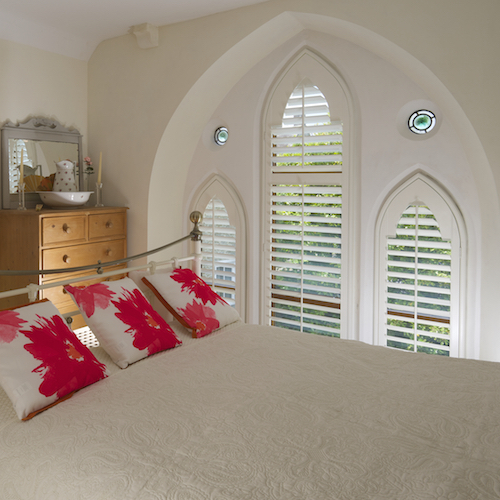 Beautiful interior plantation shutters Bristol, from your local husband and wife shutter specialists; Rob and Linda Reeves. Rob and Linda are experts in the field, trained to the market-leading Just shutters standard. They are passionate about shutters and transforming the homes of local people. Couple this with our outstanding quality, great value, second-to-none customer service, with our lifetime guarantee and you will see why we simply cannot be beaten. Whatever your style, whether contemporary and modern, or cosy and traditional, plantation shutters are timeless and elegant. Shutters do not fade, warp, or age. We are so convinced of their quality that all our shutters come with a lifetime guarantee. We have the largest range of materials and finishes in the UK, giving you choice and options to perfectly match your shutters to your room and style. Our expert Shutter Designer will work with you, he will listen and advise so that he can design the very best shutters unique to you. – and of course the stunning good looks of our made-to-measure shutters. Luxury looks and stunning design features are coupled with long-lasting value in all our plantation shutters. We have ranges to suit your budget, from our entry level CraftWood range, which comes in our five most popular colours, through to our hardwood ranges which can be tailored to the grandest of shapes and colour schemes. Whatever you need from your shutters, Just Shutters can work with you to make it happen. The value of shutters endures, energy efficiency is improved, heat loss is diminished, and no laundering or professional cleaning is ever needed. Shutters are low maintenance and add value to your home, and our lifetime guarantee means that you can enjoy your shutters years after curtains have disintegrated or gone out of fashion. At Just Shutters, customer satisfaction is at the heart of everything we do. Therefore, our experts ensure that regardless of how big or small the job at hand is they always build a bespoke package, professional yet friendly relationship and treat your home with the respect it deserves. As a result, we have been rated 9.9/10 on Checkatrade from over 1600 independent reviews – a result we are immensely proud of! Don’t just take our word for it. Read some of the feedback we have received from our satisfied customers below. Call us today on 0117 370 1594 and see how we can turn any window or door into a work of art, or follow the links towards the top of the page.